WASHINGTON — There were bagel breakfasts, a Friday night kiddush in English and Hebrew, and plenty of talk about how to keep the grandkids Jewish. In some ways, the inaugural conference last weekend of the Israeli American Council was much like other Jewish gatherings, except the Jews were Israelis and a lot of what makes Jewish America what it is remains alien to them — for instance, bagels, bilingual blessings and fears of assimilation. “We need to know each other better,” said the IAC’s chairman, Shawn Evenhaim, pronouncing what might have been the conference theme. A sense of tentativeness pervaded the conference, the first since the IAC was founded in Los Angeles seven years ago. Last year, the organization began opening chapters across the country. The conference is part of its bid to integrate Israelis into the American Jewish community. “Israeli Americans — No Longer Bystanders?” was the title of one session. “Israeli-American Double Identity: Comfort vs. Conscience?” was another. Sessions frequently became emotive confessionals that addressed an array of obstacles to Israeli assimilation into the American Jewish community — among them a distaste for community life formed around a house of worship, the liberal political leanings of U.S. Jews and a lack of Israeli familiarity with fundraising. At times, the conference seemed to veer into psychodrama. “Our two homelands are like mother and father, we want them to love one another,” said the narrator of a slideshow that included animations of falafel and Israeli flags. “I think a certain regrettable loneliness among many Israelis living here longer than they anticipated is being addressed,” said Rabbi Levi Shemtov, who heads Washington’s Chabad operations and led the Friday night kiddush in Hebrew, with explanations in English. 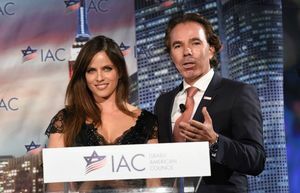 Some 600,000 Israelis live in the United States, according to the IAC, which now has six chapters across the country. U.S. Census figures report about 100,000 Americans born in Israel. The conference drew over 750 participants from 23 states. Stuart Wachs, president and CEO of the Jewish Community Association of Greater Phoenix, and Israel Center volunteer Mickey Landkof also attended the conference. Shula Bahat, who promotes the Israeli museum Beth Hatfutsot-The Museum of the Jewish People in the United States, said the community has come a long way since her arrival in 1973. In those days, Israelis back home tended to view them as having abandoned the country — Yitzhak Rabin, then a hero of the 1967 Six-Day War, called them “lowlifes” — and American Jews didn’t know what to make of them. Since then, as Israel has integrated fully into the global economy, necessitating studies abroad and careers overseas, the stigma has receded, she said. “Every Israeli family has a member of the family who lives elsewhere now,” Bahat said. That has stirred a longing to become involved, but there have been obstacles. At a session on the role of Israeli-Americans in the U.S. Jewish community, Gil Preuss described how Israelis in Boston wanted a more robust show of support for Israel’s recent war against Hamas than the broader community was prepared to offer. Israelis also resist American Jewish traditions, conference-goers said, particularly the tendency to center life on the synagogue. Ron said she has managed to build a community at the synagogue by peddling a low-key approach, emphasizing the range of activities, including concerts by Israeli performers. Another draw has been sessions for children focusing on Israeli song and dance — a response to parental anxieties about the loss of Israeli culture in the next generation. This was a repeated theme at the conference, with Israelis voicing concerns about their kids losing both their Israeli and Jewish identities. Shmuel Rosner, the Israeli journalist who blogs about the American Jewish community and who appeared on a number of panels, enjoyed asking Israelis in the audience why they wanted to remain Jewish at all. Another obstacle is the lack of Israeli familiarity with fundraising for charitable causes, even those that fulfill their own needs. Rachel Davidson, a former New Jersey judge now on the IAC board, said social pressure was an avenue to getting Israelis to give. “Making being philanthropic the price for social acceptance can be very effective,” Davidson said. With Israeli-American now referring to the children of Israelis, some of whom no longer speak fluent Hebrew, activists also faced a dilemma of when to switch content to English. On the conference’s last day, a young man approached Benhaim as he passed breakfast tables laden with bagels. Managing Editor Leisah Woldoff contributed to this story.